The Gameboy Advance (GBA) comes from the sixth generation of game consoles, and is home to around a thousand games in North America and many more in other regions around the world. Sometime during the handheld’s life span, fake games also known as pirated carts or bootleg carts, slid their way into the market; now, years later they are knowingly or unknowingly in game stores, pawnshops, on auction sites, and even worse… in our collections. You might be asking "What’s so wrong with having a bootleg game in your collection?" In the grand scheme of things I guess it doesn’t really matter. It’s not like your game collection is going to burst into flames because there’s a pirated cartridge among the masses of legitimate games, but the problem is that the games probably got to where they are right now without any knowledge of the cart being a fake. Wouldn’t it be nice to know which game is fake and which is real? The biggest problem with these carts is that they are fake and deliberately being passed off as genuine. It’s not like pirated game carts have a bright orange casing with the word "Bootleg" engraved on the back, instead, these games are purposely made to look as close to the original as the company is able to make them so that gamers and collectors don’t notice a difference. Bootleg GBA games are usually sold by stores or auction sites not knowing that what they are selling is fake. Since they believe it to be real they will sell it for the same price as a legitimate cartridge. I’ve run into fakes in many stores; sometimes I’ve informed the worker and they either didn’t believe me or didn’t care. Another problem with pirated carts is the lower quality. We all hate when our NES and SNES batteries die and all of our saves get erased? Well, there are very few official GBA games that actually use a save battery, instead most use a memory chip of varying types to save the data. Bootleg GBA carts use save batteries. With a fake Gameboy Advance game, your batteries will eventually die whereas if you had a legitimate copy your saves stay until you decide you want to start the game over again. Now that we know these games are out in the wild for us to waste our hard earned money on, and possibly in our own collection, let’s look at five different ways to tell the fakes from the real thing. 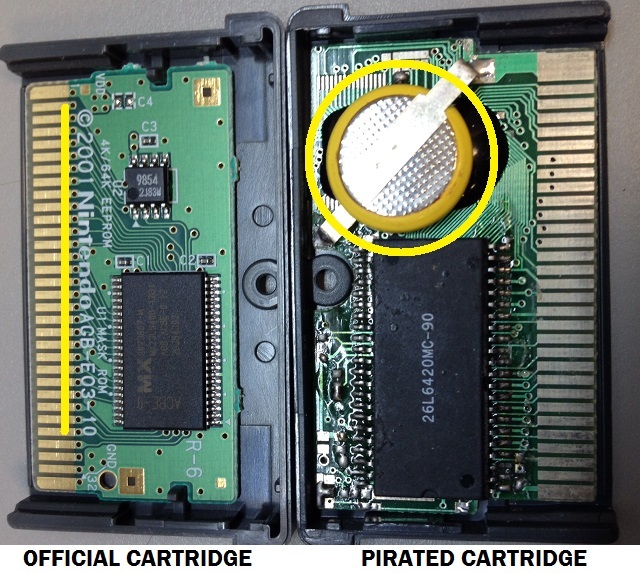 Next, one other way to tell if a cart is fake is by using an individual GBA game case. 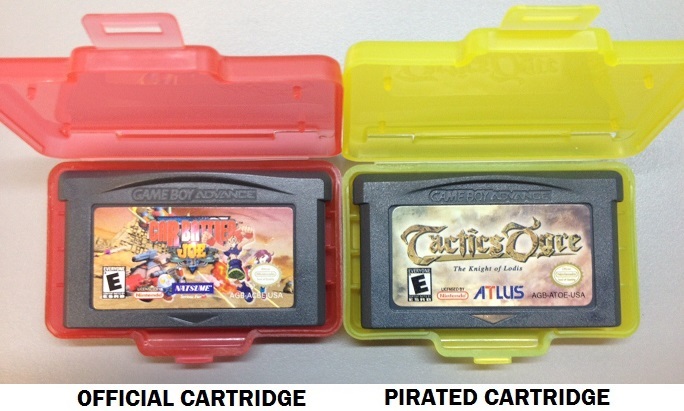 The dimensions of bootleg GBA games are usually slightly different from legitimate GBA games. An official GBA game will fit nicely in this game case and come out easily, but since bootleg GBA carts are a hair bigger they will be harder to get in and out of the case. 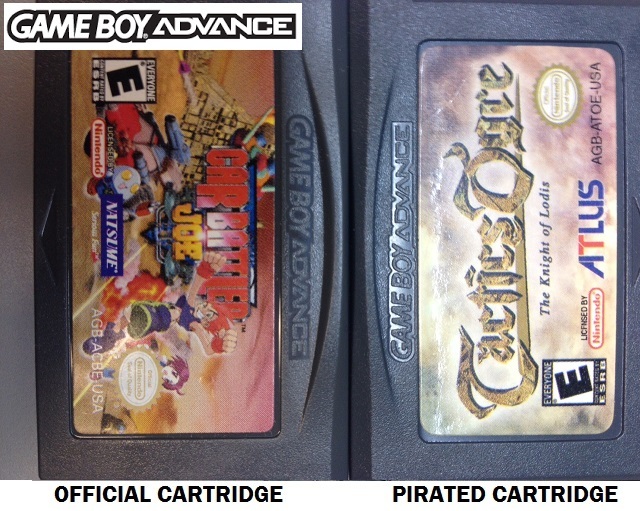 Lastly, the label artwork on bootleg GBA games are slightly different from their legitimate game counterpart. If you’re questioning the authenticity of label artwork you can always search for a picture of the cart on the internet. After searching, if there is a difference in label art between the picture and the cartridge in front of you then one of the two is fake. (This idea does not include double pack variants, best seller/greatest hits variants, or other official label variants) Remember, Misspellings on the label or cartridge, or poor printing on the label are dead giveaways that you are looking at a fake cart. Pirated Gameboy Advance games are floating around everywhere these days so use this new knowledge to not get ripped off and to make sure you’re only buying official GBA cartridges. Take a minute to go through your own collection and weed out any fake carts that have snuck their way into it. Being able to spot a fake cart is only going to help you on your way to collection perfection, and maybe you can even impress a few people on the way. One thing also to look out for with bootleg GBA carts, is that some of them actually just straight up have the wrong Model Number on the back of the cart. Quite a few of the bootlegs I've seen have the model number AGB-004 on the back. AGB-004 is actually the model number for the GBA SP charger. Also one other thing to look out for is fake Pokemon cartridges. They are fairly common, and one thing many of the bootlegs have in common is that the bootleg cartridge will be a different color shade than the legit cartridge. Pokemon Emerald bootleg cartridges often just used the a shade of green similar to that of Pokemon Leaf Green rather than the dark green it is supposed to be, due to how late Emerald came out for example. The model number is a good method to use too. Correct model number is "AGB-002"
Good article to have on here. I always just go for the Nintendo print on the board if nothing else looks off. Another common mistake is the positioning of the label. I haven't seen a legitimate cart have a label that wasn't perfectly straight and center. 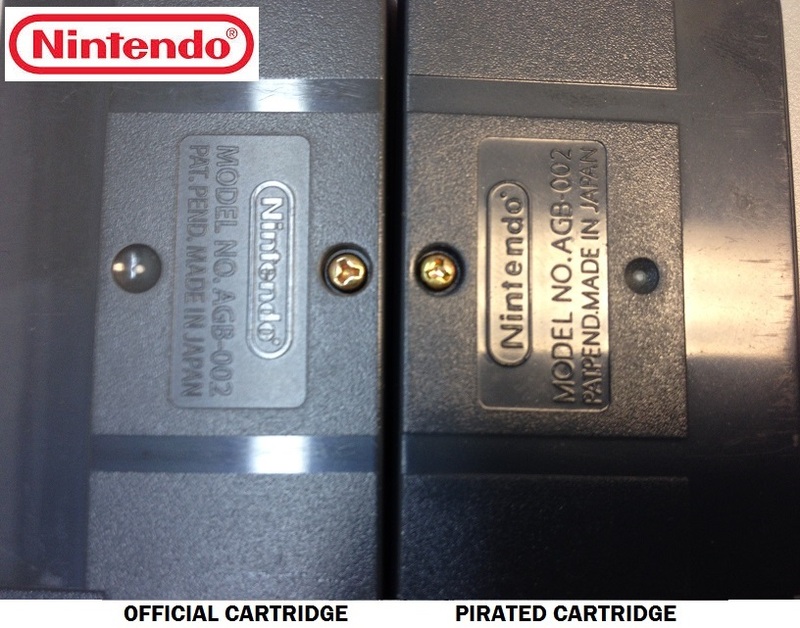 While the pirate cart used as an example here is pretty good, I've seen pirates with more obviously hand applied labels. Doom was a pretty commonly pirated cart and most of the pirates changed the ESRB rating to E. Not sure how often that happened for other games. Another thing that I've noticed that can help you see if its fake or not is stamped numbers on original gameboy advance carts. You can see them at certain angles. Single and double digits, stamped into the label. I'm pretty sure fakes dont have that either. Some newer bootleg games are much harder to tell the differance. They have the nintendo logo on the chip, don't use battery save, have exact labels, have the number stamp on the label, but the gba logo is still messed up, there still slightly thicker. The one new thing I have not seen on older fakes is the newer ones use cheap Glop chips on the boards.